The Lower Owens is on its way down! We now have a flow rate of 240 cfs down from a super fast and nourishing 600cfs. This has allowed us to fish the river for the past week with awesome results! Not much to be said for dry fly action, yet anyway .. although some rising fish are noted throughout the day it could start big time at any hour! That being said the nymphing and streamer fishing has been great! High Sticking, High Sticking Tenkara style, nymphing with, or without an indicator ..pick your practice and get those flies in the water. As usual we have some special soft hackle nymphs tied on Jig hooks for a slightly different presentation and drop rate. Midges? Yes! lots of Midges and Midge Emergers of different styles have been taking a lot of fish when presented correctly. Stay tuned as an amazing Lower Owens River lowers its high flow rates to let us Fly Fisherman see how the high volume of water and food has affected the Trout in a very positive way. Crowley Lake near Mammoth Lakes Fly Fishing is nearing the end of the season… But not without a bang! The North end of the lake has been a steady producer of Big Trout these past weeks! From Alligator north to Green Banks and the inlet of the Upper Owens the fishing has been on fire. That is if you like Big fish on the end of your line! Search for these Big Trout in anywhere from 8-12 ft of water using the standard Crowley Buzzer Chironomids in #12-16 in various colours that we carry at the Shop. Out on the Upper Owens River the fly fishing has been very entertaining the last few days. Just down from Mammoth Lakes the Upper Owens meanders through one of the most beautiful sierra meadows you will ever see. Flows are down to around 100cfs, low and clear …(the flows are visible on the upper black bar on all the pages on this website). Fishing has been a mix of deep nymphing, some dry fly action for smaller trout, and an occasional toss of some sort of a streamer pattern. Small Caddis and Mayflies make up most of the diet on the surface while the nymph stages of those insects are on the menu down below. 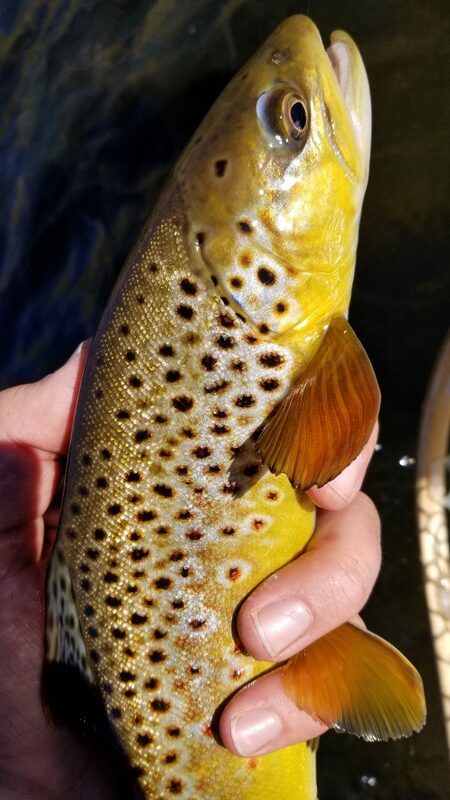 This is the turning point time of year where the Crowley lake beasts make their way up the Upper Owens River making it possible for any angler to catch a world class trout right here in the Eastern Sierra. SJ Worms, Pheastant Tails, Robo PT’s and Tungsten Jigs are some successful nymph patterns at the moment. Elk Hair Caddis and similar patterns with a good mix of Baetis top-water patterns are good bugs to have in the quiver for when you find those foam risers. Big big big fish are being hooked up on Crowley Lake by the most focused of fly fisherman, the ones that don’t stray from the intense line of sight strait to their indicator! Up in the north arm near the entrance of the Upper Owens and along the rocky point and bay of the L. springs area seem to be the recent places to find some nice fish. In anywhere between 9-16′ of water the fine trout of Crowley have been aggressively eating. Fish Crowley midges upon arriving #14-18. If you want to get creative tie a small perch fry instead of the top midge later in the day. Most action is had on the Chironomid Midges as this is what keeps Crowley a healthy fish producing factory! The Jewel of the Eastern Sierra the Lower Owens River remains high for us fly fishing addicts down in Bishop. At current flows of high 500’s she is a real fast mover but there are places where she shows us the beautiful Trout she possesses. Slow moving foam lines and dropoffs can hold a lot of fish. Deep nymphing attractor patterns are what are taking Trout here. Robo and T-Jig Pt’s, Midge emergers, and Green Caddis Worms are on the menu! When these flows subside the fish in are there… waiting to show us what they are made of after two years of high water volume and more food coming at them than they are usually accustomed to. The Upper Owens River fly fishing has been a delight to fish this late Summer! Even though we are seeing cooler temps during the nights there are still some grasshoppers around keeping the fish tuned in. Flows are low and clear all the way to Crowley with minimal weeds. A few fish have been making their way up from the lake, nothing huge… yet… Fish Caddis and Mayfly nymphs and dries. Streamers and hoppers are definitely worth throwing out there depending on conditions. Wind can blow hoppers and terrestrials in the water! Make sure and check the regulations as they change around this time of year.. It is always barbless above the Bridge. 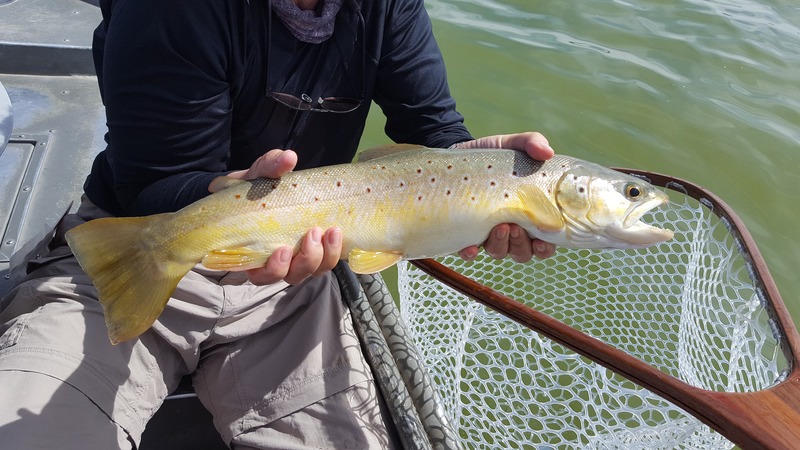 Crowley Lake fly fishing has been good – slow – great. The Algae bloom has come and had now subsided a bit in some parts of the lake. It was a green soup for a while but yesterday water was much more its usual colour. The North Arm along Green Banks and across the arm has been the place to be as of late. 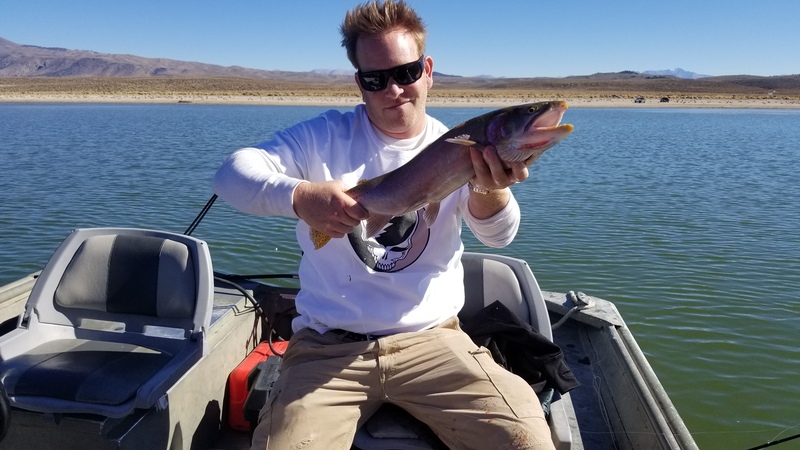 Weather systems, mostly composed of wind, has been touching the eastern sierra recently making the fishing on Crowley a combination slow and very exciting fishing. The Sacramento Perch fry seem to be arriving late this year. This gives fly anglers the possibility and likelihood of an amazing Fall fly fishing on Crowley Lake! Tie on the usual Chironomid style fly offerings and don’t forget to carry a few different sized Perch patterns from about #14 up! Within the last couple of days the Lower Owens River has dropped to a lower flow of around 33o cfs!! This opens up an amazing amount of fly fishing river to give access to some amazing sections that hold some hyper strong wild Brown Trout. Water temps are upper 50’s due to the cooler nights and lower overall day temps we have been experiencing. The river is full of bug life with midges and Caddis with an occasional Stone fly skittering over the water…running a gauntlet of Trout. The fish are definitely looking up to the well placed Stimulator, Terrestrial, and Caddis patterns. The size of the bugs out will tell you what size to use. Stoneflies are big, Caddis are medium-sized, and Midges are small….. It is wise to start light on the nymph and less deep than normal right now as fish are active and don’t need to see their meals hugging bottom to eat. This is the time for this river as summer turns fall and all around temperatures drop. Crowley lake has been a steady fish producer throughout the season. 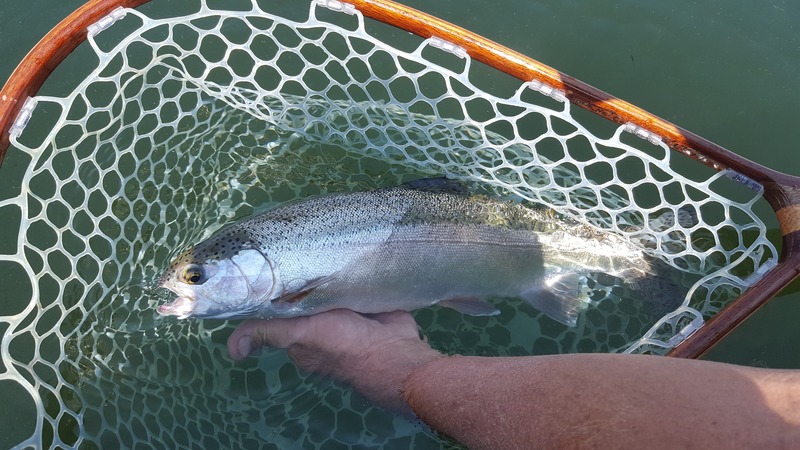 As usual for this time of year there is a lot of fish in most popular areas, pretty much all of Mcgee bay is roamed by Rainbows, Browns and Cutthroat Trout. From aroud 7′ to 20′ of water fish can be found. It is now Perch Fry time of year. We usually will always have a Perch imitation of some type while fishing Crowley this time of year. They will still always hit the midge but there is a great chance to find a pod of Trout keyed in on Perch Fry. Crooked Creek now has some smaller fish that are willing and can be a day saver when the wind comes up or you just want to find something that makes your indicator move. Fish various Perch Fry patterns with the standard Crowley Midges beneath them in anywhere from 7′ to 20′ of water… Its a lot easier to cast the shallower water setup, but the payoff for going deep can be awesome on Crowley!